Shop our gold light up shoes for adults and kids. 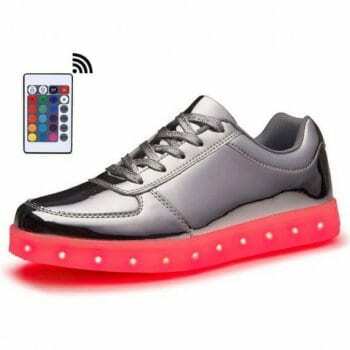 Our Gold LED shoes light up multi colors and come in various styles and sizes. If you’ve always been the flashy one, and love being the center of attention, then these gold light up shoes are sure to catch the eyes of everyone around you. 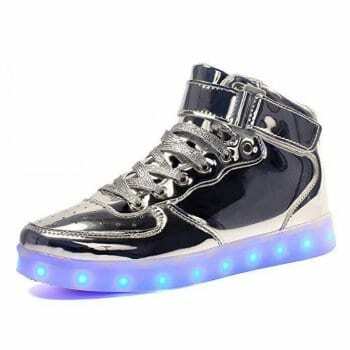 These gold LED shoes are incredibly shiny and fashionable. Not only will you have all eyes on you, you’ll have the Midas touch on your feet. Available in the classic low top and high top styles, these golden are sure to be an impressive take on a classic design. If you’re looking for something that’s showy, but not tacky, these classic high top gold LED shoes are a guarantee. 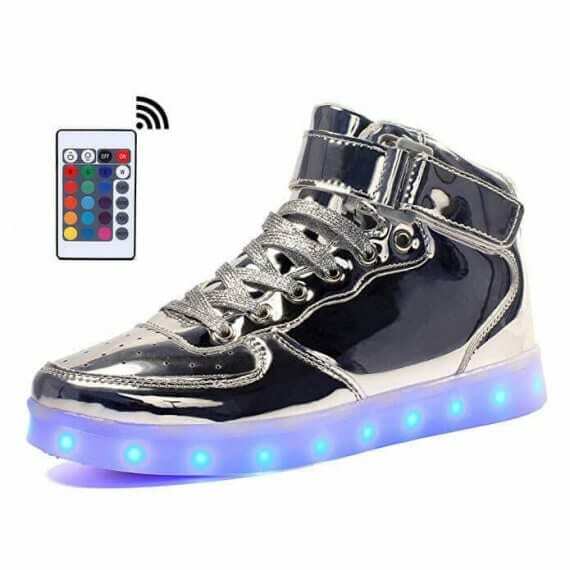 With the classic high top sneaker design and an amazingly eye catching design, these awesome light up shoes will have you and your friends seeing gold. With up to seven colors and eleven lighting modes, there are countless ways to express yourself with these LED up light shoes. 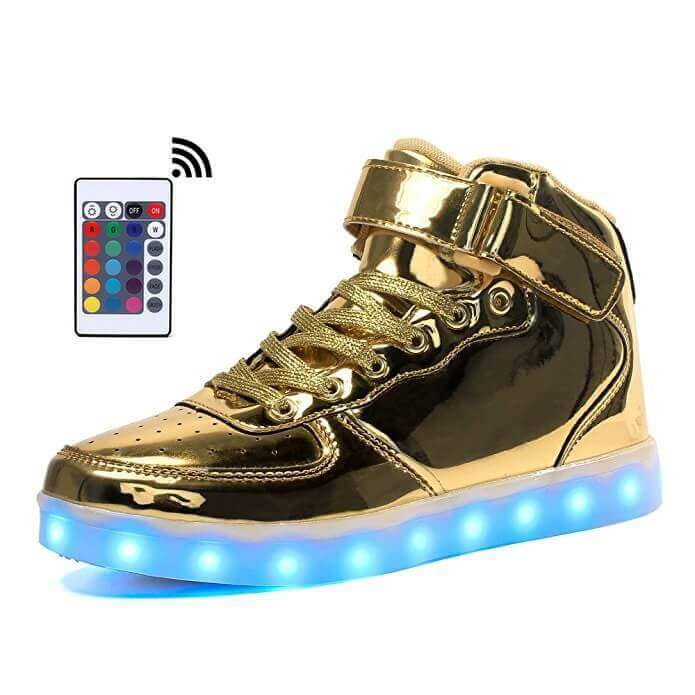 The LED lights charge via USB cable so you can plug it into your computer or with a wall outlet adapter and you’ll have your light up shoes gold in action for six to nine hours! The lights are also completely waterproof so you don’t have to worry if the street is wet, your friends will be way too busy being dazzled by your brilliance with your new LED up light shoes to even notice. Need an everyday pair of shoes that still wows your friends? 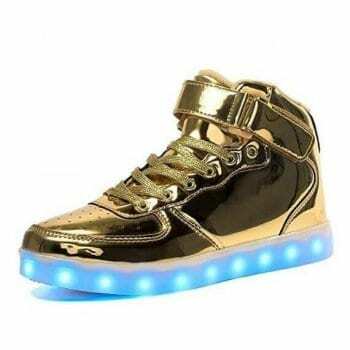 Look and feel like a king every day with these low top gold LED light up shoes! Made of leather and with a comfortable and stylish design, these cool looking light up shoes are made for the man with a plan. Featuring seven different colors and up to eleven lighting modes, you’ll always see where you’re going. Plug them into any USB port or wall adaptor after your run and they’ll be ready for your next outing. Need to get somewhere while it’s raining? Have no fear, the LED lights are waterproof. Going out on the town at night? These gold light up shoes will let you see where you’re going for up to nine hours. Be King Midas himself with these gold LED shoes. With an eye popping and fashionable design, these high top gold women’s light up shoes are guaranteed to be the selling point of any outfit! Made with a comfortable, sleek leather material, these stylish gold LED shoes are not only designed to look cool, but also to be comfortable enough to walk in all day long. The LED lights last up to nine hours on a single charge, and charging them is super easy: just plug them into a USB port. With seven different color to choose from and eleven different lighting modes, you can mix and match the LEDs on your light up shoes to match whatever outfit or accessory you are currently wearing. You won’t even have to worry about walking around in the rain as the lights are completely waterproof. That’s an extra cool, impressive pair of shoes to pair up with any snazzy outfit that you can pair up super easily with a matching necklace or ring. Perfect for everyday use and extra nice for those super trendy outfits! If you think high top shoes are too flashy, or don’t match every outfit, or aren’t really your style, then you might be right. If that’s the case, then these low top gold LED up light shoes are for you. With a gold leather material and classic design, you’ll be eye-catching, but not tacky. These light up shoes are the perfect complement to an outfit that doesn’t try too hard to be flashy. With seven stylish colors and eleven unique lighting modes, this pair of light up shoes will match any color scheme perfectly. Whether you’re out in the club or at the cafe, you can be sure that these trainers will light up your day, and stay lit for up to nine hours. Finally home after a long day? Just charge them in any USB port and you’ll be good to go for another nine hours. 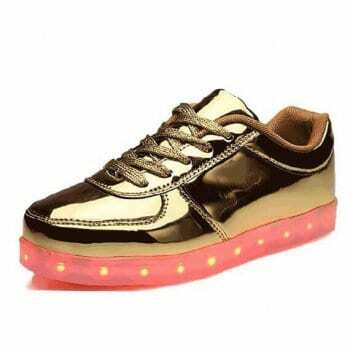 Always look your best with these stylish gold LED light up shoes! At school or on the playground, be the coolest kid around town with these super cool high cut gold light up shoes. In a comfortable, but cool gold design, these shoes look pretty awesome solo already. But to up the cool factor by ten, just turn on the LED lights under them, and every kid around you will be staring at your high tops with jealous eyes. Amaze your friends with the seven different lights and eleven different light modes! Run bright, LED powered circles around all the kids at the park and stomp in puddles without worrying about your shoes because the lights are waterproof. Look cool and feel awesome with these cool high cut sneakers for up to nine hours per charge! You can charge them super easily with any USB port or wall adaptor; you can even use the one for your phone. It’s really easy to have a lot of fun with these, just imagine running around in the dark with all your friends. If all of you get a pair of these, it’ll be ten times the fun with all your LED light up shoes lighting up the playground. 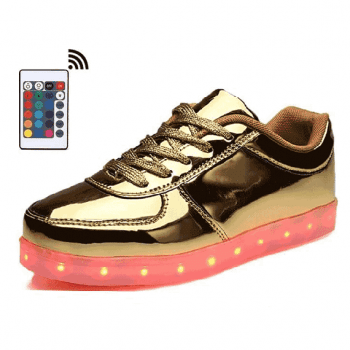 If you have a small child who likes bright, shiny things, then they’ll love these gold light up LED shoes! With the classic easy to use straps and a classic low cut design, your toddler will love running around the playground with these shiny light up shoes. Any and every toddler likes bright lights, and they will be absolutely entranced by these colorful kids LED light up shoes. With seven pretty colors and eleven different lighting modes, your little one will think that their shoes are magic! Toddlers love to stomp around in puddles of water, but that’s not an issue for these shoes, as the LED lights are waterproof! After a fun day of playing and running around, the shoes are easy to charge in any USB port, so while your toddler is taking a nap, you can have them charged ready for another nine hours of fun!